I’m cozied up in my room stitching Wild & Goosey blocks! It’s amazing how resourceful one can be when needed ---after dinner we stopped by the Dollar Tree so I could get some outlet extenders --- Hotels never have enough available plugs. These will now live in my suitcase for future use. I must say however, that the iron is driving me nuts --- it’s one of those that shuts off in 15 minutes, and I have to un-plug it and re-plug it to start it up again. UGH! I'm laughing at the caption on the iron ---because my BRAIN feels the same way quite often too! AUTO OFF after 15 minutes --- UNPLUG to reset! Let's just say that my evenings in my room stitching away is the equivalent of "Unplug to Reset". I evidently forgot to pack my small travel iron ---maybe I need a second one of those to just LIVE in the suitcase too? But now that I have the plug extenders that is a lot easier to accomplish than crawling under the desk every 15 minutes! That round tray? It’s the tray for the ice bucket and it’s perfect to keep the crumbs from falling off the desk and on to the floor. I find it easiest to just grab a handful of crumbs.....and work with just that handful until I can't work from it anymore...rather than digging through a large bucket and being faced with too many choices when looking for the "right thing." When the variety starts to be lacking in the handful I'm working with, I add another handful to it to spice it up a bit, and keep going. My crumbs are contained in a plastic zipper pouch that a sheet set came in. Do you save all these for quilting totes too? I probably even BOUGHT these sheets for the simple fact that they came with a zippered pouch! Not like they would ever be used for sheet storage --- but they are perfect for transporting crumbs in the suitcase…. I’m winding down this day with a bit of TV as background noise, my jammies, a hot cuppa tea, puttering on the computer, and stitching up some MORE Wild & Goosey blocks! Quipped by Bonnie K. Hunter at 9:10 PM 33 Snips & Comments by others! 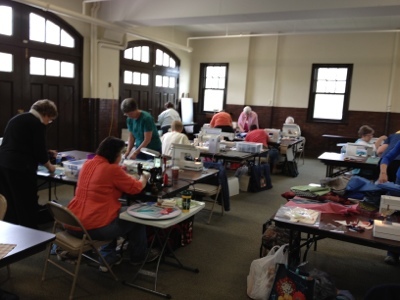 We are quilting our brains out in Moline, IL---our class is being held at the "Garage" of the home of Kathrine Deere Butterworth, who was the daughter of John Deere, Tractor King! We are working on the Smith Mountain Morning blocks---having a great time! 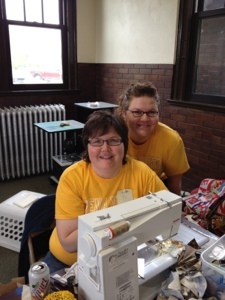 Do you recognize Kelli and Jo Kramer of Jo's Country Junction??? Fun to spend time together again!! Quipped by Bonnie K. Hunter at 2:58 PM 10 Snips & Comments by others! This is the last shameless plug --- because it is the last day that you can cast your vote! It's the last day to cast your vote! 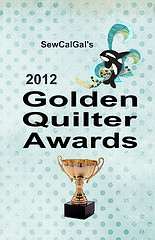 I've been nominated in many categories ----If you haven't voted yet, would you take a minute to do so!? All the info is found in this post HERE!! This is a sign I found at The Machine Shed last night at diner..don’t you love it?! Quipped by Bonnie K. Hunter at 11:53 AM 4 Snips & Comments by others! I spent much of my day sitting in terminals with THIS crowd. Take a look at the two Chinese guys…they look identical! They crossed their legs the same, they dressed the same ---I didn’t even notice it until I uploaded this photo. FUNNY! But you can imagine me here ---- sewing hexies…and sewing MORE hexies ----and listening to my book on my MP3 player ---and occassionally checking gate information. I missed my connecting flight when I got to Chicago too late to catch it. The 3pm flight I was to catch NEXT was pushed back until 5:38 PM --- and they didn’t even KNOW if they would have a plane then --- so I went to the customer service counter to see if I could get booked on another flight --- and they had one that finally left Chicago about 5:30pm. I’d been sitting around the Greensboro airport for 3 hours more than I should have, and then spent 5.5 hours at O’Hare! But at least GETTING here HAPPENED! THIS was the best thing to happen to me this whole ordeal --- I got upgraded to FIRST CLASS! For a 45 minute flight. But hey, I’ll take it! When I got to Davenport --- I made a beeline to the baggage claim, hoping that my bags had made it. I had changed flights so many times, I wasn’t sure if the bags stuck with me or not. Upon entering the baggage claim area…WHAT do I see in lock up behind glass doors? MY BAGS! See them? Two big army green duffels and my grey suitcase is the one with the pink fabric strip tied to the handle..LOL Tell me HOW my bags made it before I did if I missed that connecting flight ? Maybe they had already closed the boarding door, but luggage still have time to make it on? At least it was there, and it was DRY and waiting for me. This scenario was easier to deal with than having my bags block the chute on the carousel in Little Rock! Davenport is, of course, the home of the John Deere Museum….and being as I was STARVING we thought it would be fun to head over to The Machine Shed for some home-style grub – what a fun place! It’s family style…and you can get a hay ride before you go in and eat! There are all kinds of old farm machinery out front – and what little kid wouldn’t love climbing up onto this huge vintage Farmall tractor? This little guy was bouncing in the seat, just ready to plow or harvest, or do whatever it is that farmers do on a tractor.he was ADORABLE to watch! Can you tell his legs are blurry because he couldn’t stop bouncing on that seat spring?! Adorable! We ate our fill, talked and gabbed and got to know each other, two guild ladies and me --- and before I could take my last bite I knew I was done for the night --- it had been such a long day – I just wanted to see my bed and crawl into it. My Room! Lodge Theme included! How comfy does this bed look? How great is this desk for setting up my featherweight and doing some piecing while I’m here in the evenings?! Check out that chair made of “twigs” :cD I”ve got a beaver for a mascot! Even the little bathrom is woodsy and cute ----I’m so comfy here! But I can’t stay comfy for too long. Wendy is picking me up at 8am and we are headed out for our first of 3 workshops while I’m here. Today is Smith Mountain Morning. I understand she is serving BBQ pulled pork sandwiches for us for lunch. I’ve got ladies coming from several different states to join in the fun ----It’s going to be a great day! Quipped by Bonnie K. Hunter at 7:27 AM 21 Snips & Comments by others! This is getting to the point of hilariously ridiculous – seriously it is. The story goes like this ----I just went to take a couple book orders to the post office yesterday afternoon, trying to keep things caught up before I left for Iowa. Innocent enough, I assure you! Well, Peeps, I FOUND KEN! This is Low-Rider Ken --- LOL! His center of gravity is hunky, chunky, and lower to his base than either Marilyn or Barbie –I asked the guy doing the selling about him, and he thought there might be some issue with the motor on this one because it heats up and smokes. NO THANK YOU! Sorry, Ken, but this Chiquita is a Non-Smoker! This just won’t do ----but you know what? Ken had a friend! Meet "Joe Cool!" And he is a two-toned handsome devil with a steel-grey metallic paint job accented by ivory and oh --- he’s got the same body style as Barbie…. ((can you see the difference in how much more space this guy has in his mid-section than Ken? Now, I wasn’t going to buy him. Honestly, I wasn’t – but to the right is an accessory box part – and IN IT was a part that I needed ---not for myself of course, but for MARILYN! And I couldn’t get the guy to sell me just the part --- but Marilyn can’t live without this part because of her home needle position being left to the center and unchangable ((It’s like Nemo’s Lucky Fin, ya’ll – you just have to work with it!)) So – I told the guy, I really don’t NEED this machine, I need the accessories that come with him, so --- how much would you sell him for? 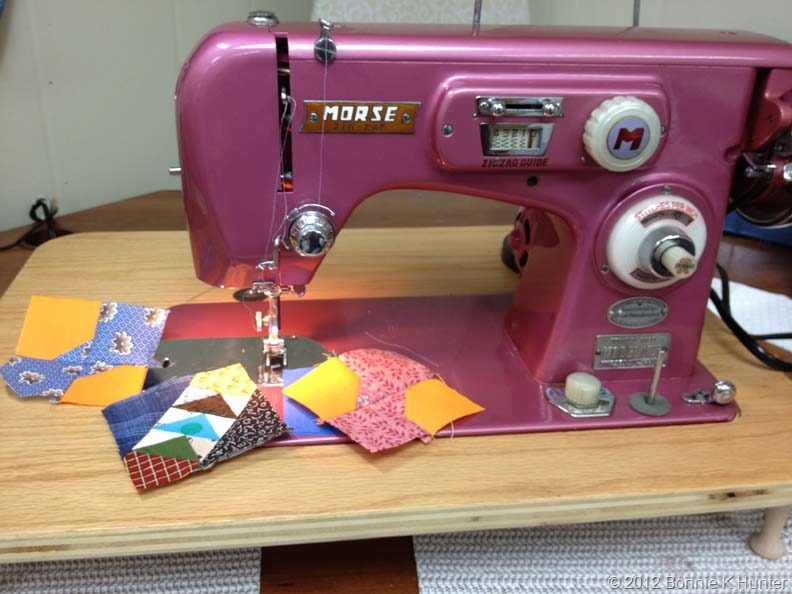 $30.00 is a lot for a seam guide that will work with Marilyn, but because Marilyn is a lefty ---and the regular seam guides can’t get close enough to 1/4” without being ON the feed dog – and I didn’t know if I would ever find another seam guide like this….out came the card. Now Barbie doesn’t have KEN ((He’s kinda short and fat and squatty anyway and he SMOKES! )) She has the flashy Grey Wizard….and Marilyn? She is now sporting her new curved seam guide that rides out in FRONT of her wider "Lucky" presser foot so she can get a good 1/4” seam and sew happily ever after! I’ve been looking all over for more on Marilyn Morse – here is a video to see how she runs. You’ll see the gal doing the demo even talks about these being permanent lefty machines when it comes to the straight stitch. ((right after it hits the 3 minute mark on the video --)) But these machines can sew through 5 layers of denim, no problem -- she sews through 3 layers of leather --doesn't slow the machine down. WOW! Now that I’m far away in Iowa ----I’m safe! And yes, this post does come with a theme song --- try to get THIS one out of your head! I couldn’t --- after I replaced the word “MEN” with “MACHINES!! IS there a cure? Do I want one? Quipped by Bonnie K. Hunter at 1:39 PM 39 Snips & Comments by others! Yes, I'm still n Chicago. Actually, I just GOT to Chicago. Because my flight was delayed out of Greensboro due to Chicago storms. I'm still on my way to Moline-- just a few hours late. I hope the bags stay with me, or at least are waiting for me by the time I get there. If there are no people flights, how do bags get there ahead? I have no idea but it happens! Here is a pic of the hexie section up to date. In case you wanted to know how many hexies you can add from Greensboro to Chicago, the answer is. ((Insert drumroll)).....13!! I've got 2.5 hrs til the next flight boards so I'm sure that number will increase! I should arrive in Moline about 4pm now---barring any more weather upsets! Quipped by Bonnie K. Hunter at 1:20 PM 8 Snips & Comments by others! 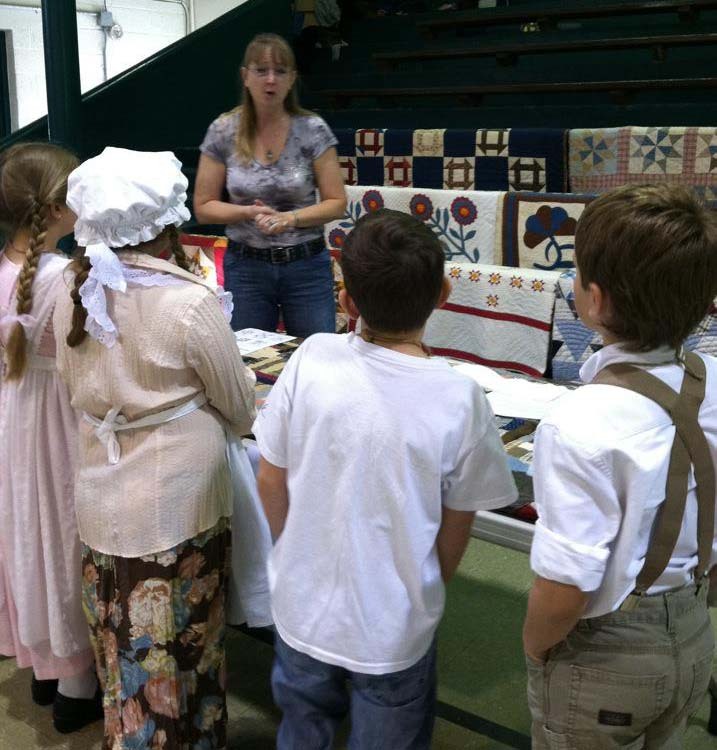 It was 69 degrees as I pulled out of my drive at 7am to make the 25 mile drive to Lewisville Elementary School to take my place as Quilt Assistant for our “Old Timey Day 2012” pioneer demos. Do you see that sun rising big and golden in my rearview mirror? The radio was on, the weather report said “Today’s high – 80 degrees” and not a cloud in the sky! I got there in plenty of time to load one body-bag of antique quilts onto my little rolling cart and make my trek across the parking lot, down the side walk, and to the doors to the gym where our portion of the event was being held. Old Timey Day is a special treat for the entire 3rd grade ((I thought it was 5th, I was wrong!)) and have this activity after studying the history of NC through the colonial years and into the civil war era ---and they dress up! Today Karen and I were cracking up at one little guy who looked quite the dandy in colonial day knickers, lace-trimmed ruffled shirt, vest, tricorn hat ---a real Beau Brummel to be sure! And next to him, his fellow classmate was dressed in a civil war uniform complete with red stained bandage around his head. What was even funnier, as this civil war soldier went from demo to demo to demo – they get 15 minutes at each station --- his bandage changed locations. First it was on his head, then the next time I saw him it was wrapped around his leg --- and then it finally wound up ((literally –WOUND UP!)) around his arm! I love the kids this age, their bright smiles are full of big teeth, and they are so eager to learn. I displayed the quilts over the bleachers ---I thought they made a very fun display! School house cursive writing with pen & ink, butter churning, so many different activities! 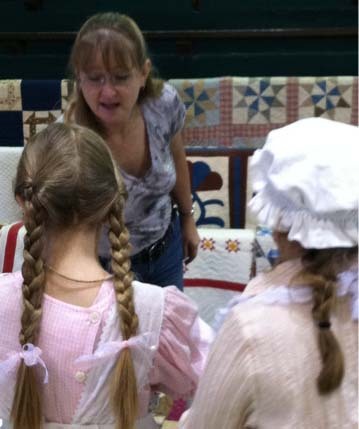 And of course, they had QUILTING! LOVE the pants tucked into socks and the suspenders and hats..and of course the girl’s outfits were fun too. At this age they aren’t worried about “looking dorky” They just PLAY! 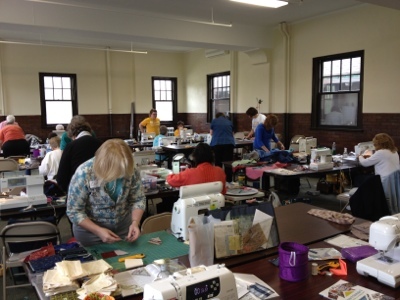 Since each group only got 15 minutes with us…we got right down to talking about fancy quilts ((whole cloth and applique)) and how only really wealthy people could afford to by long lengths of fabric specifically for quilt making. And we talked about the old scrap bag and how patchwork patterns evolved over time to use even the smallest of scraps, many quilts being made out of the good parts left from worn clothing. Of course, most weren’t interested in the lecture part --- they wanted to start arranging shapes to make blocks! Turning those triangles the right way and putting them on the flannel board is not as easy as one would think, right!? Let’s take some stab stitches in the quilt in the hoop --- this is NOT as easy as it looks either to keep those stitches small and close together so the quilts don’t fall apart too quickly! What is always so interesting to see is that the BOYS love the sewing part, and often don't want to stop to move to the next station until they've finished all the thread on their needles! Doesn’t this sweet girl just look like Holly Hobby?! I LOVED their effort on the costumes! We really did have a great time, and noon and lunch time – marking the END of our activities was there before we knew it! I “almost” missed not being dressed up in my pioneer dress. Next year, Karen, RIGHT?! I’m off to Davenport Iowa this morning. Very excited to be meeting up with several quilters I’ve only known via the internet ---we have a great time planned out, and I can hardly wait to get there --- yes…hexies all the way! Quipped by Bonnie K. Hunter at 7:14 AM 9 Snips & Comments by others! Unless you are a wood worker, this is going to REALLY bore you ---so call your hubby over, and go get a pedicure while he reads all this stuff, and that’s ONLY if he is the wood working type of guy! I told you I’d at least post pics of the wooden table so that IN CASE someone knows someone who knows someone who likes to tinker ---you get the idea? I couldn’t do this, nor do I know anyone who would do this, but perhaps cabinet maker types would. This is the TOP of my wooden extension table. There MAY Be easier ways to make these….I’m not sure… but basically the top is a piece that measures 22” X 15 3/4”. It’s 3/4” oak finished plywood, stained and varnished. If I remember right he did them in other woods too –I just like the sturdiness of oak and thought that scratches, which are bound to happen when working with pins and needles and scissors and seam rippers and other sharp stuff--wouldn't be as visible on lighter oak than say, dark cherry or mahogany. The opening itself measures 14 3/4” wide at it’s widest, not including the little lip inside…. This is a close up of the grooving going on on the right side ….different machines have different wiring and things that need spaces cut out for…. This is the bottom side….4 holes are drilled partway through to allow the 4 3” peg legs to fit. You can see the washer and nuts that hold the screws from the front of the hinges. As I said, these are 3” wood pegs that should be pretty readily available. I also bought some little foam circles that stick to the bottom of these…it keeps them from shifting on the table top. Here’s a pic of my Blue Wizard in the table…fits great! I love how this table fits so MANY of my machines…. ((Even if Barbie has an issue with it!)) I was piecing a small amish stringy for Tonya back in 2008! I’ve also got a table for 3/4 size machines such as my Spartan and my Singer 99. This one has “different” measurements --- let me know if you need them and I’ll get it out and measure. Quipped by Bonnie K. Hunter at 5:09 PM 27 Snips & Comments by others!